There were three big clássicos (local derbies) in the third round of games in the state championships this past weekend. With the state championships following a league system with knockout matches to happen a few months from now, the games in the third round of the state championships mean very little in the bigger scheme of things: even if they drop points now, the big clubs have plenty of time to claw back points and get themselves into a knockout phase qualifying spot later on. In the weekend gone by Santos played São Paulo, at the Pacaembu stadium in São Paulo. Botafogo hosted Flamengo in the Carioca championship, while in Minas Gerais the match between Cruzeiro and Atlético Mineiro went ahead amid immense grief and sadness following the Brumadinho mine dam collapse disaster which happened in the state just a few days ago. The coaches and players also take these games seriously. The managers can try out new players, tactics and formations and the games serve as a good barometer of how a team is progressing ahead of the bigger tests to come. After a nervy openings game last weekend, Santos seem to be getting into a stride under their new coach Jorge Sampaoli. They put four goals past São Bento away from home on Thursday and they comfortably beat São Paulo by two goals to nil on Sunday, thanks to goals from Paraguayan Derlis González (who now looks set to stay at the club) and defender Luiz Felipe. Curiously though, after the game Sampaoli said that he wants his players to run less! Flamengo came from a goal down to beat Botafogo 2 – 1 in the Carioca state championship. It was an impressive debut from Bruno Henrique (signed from Santos), who came on at half time for Vitinho and scored both goals. The club was competing on four fronts last year, but ultimately they fell short in the league, Brazilian Cup and Copa Libertadores. With Abel Braga in command now and the club having made some big signings with the proceeds of the Lucas Paquetá sale (Arrascaeta, Gabigol and Bruno Henrique) they are looking strong. Botafogo, meanwhile, lack quality. I tuned into the clássico between Cruzeiro and Atlético Mineiro at just the right time with ten minutes to go. Fred had given the home side the lead with a penalty, but it all kicked off when I tuned in. A comedy of errors lead to the equaliser for Atlético. 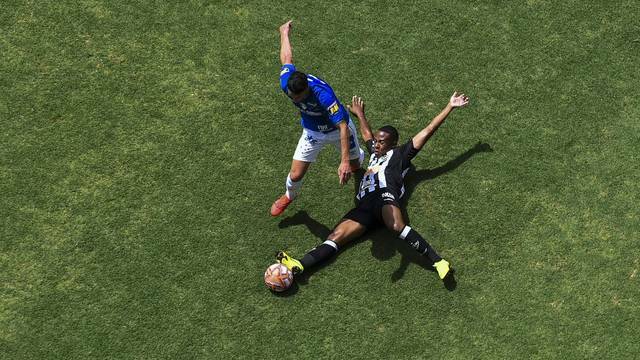 Chará made a rare break from midfield before playing in Ricardo Oliveira, who miscontrolled the ball, but continued to pressure Léo, who panicked and played a poor sideways pass to Dedé, who miscontrolled it and brought down the onrushing attacker inside the box. Penalty and a second yellow card for Dedé, who was sent off. Fábio Santos dispatched the penalty and followed it with a muted celebration and tribute to the victims of the Brumadinho disaster. Atlético suddenly had confidence, were a man up and now looked like the team most likely to win. They couldn’t make the pressure count though and they themselves had a man sent off in the ten minutes of extra time that were played. 1 – 1 was the final score. Meanwhile, in the big transfer news over the last week Dudu renewed his contract with Palmeiras, ending speculation (for now) that he could be set for a big-money move to China. Rodriguinho has had enough of Egyptian football will be returning to Brazil and playing for Cruzeiro this year, while Corinthians announced the signing of veteran striker Vagner Love, who had been playing in Turkish football. Brazil’s under 20s did just enough to qualify for the next round of games in the South American u20 competition. In the first round of group games, they lost to Chile, drew with Colombia and struggled to beat Bolivia to book a place in the next round. Not very inspiring. Dull. Speaking of young players, São Paulo won the Copa São Paulo – the premier youth competition in Brazil – by beating Vasco in the final on penalties. Vasco had done really well to get back into the game by reducing a 2 – 0 deficit, but they went on to miss three penalties in the shootout to hand the cup to São Paulo. I didn’t watch the game, but it looked pulsating and of a high quality from what I saw in the highlights. São Paulo’s right winger Antony impressed me with his good left foot. Finally, on the injury front, Neymar has suffered a re-occurrence of the metatarsal injury that affected him before and during the World Cup while playing for PSG last week. This injury isn’t quite as bad but it looks like it will require surgery and that the player will be out for some time. This entry was posted in Brazilian football, State Championships, Weekly wrap and tagged Atlético Mineiro, Bruno Henrique, Copa São Paulo, Cruzeiro, Flamengo, Neymar, Santos, São Paulo by Brian Davidson. Bookmark the permalink.